Think about a barter economy that uses no money and in which people exchange oranges for apples. Basically, in the orange market, some people do have a demand for oranges. Other people produce oranges and supply them to the market. People who have apples are prepared to exchange them for oranges at a certain price. Producers of oranges are also prepared to exchange oranges for apples at a certain price. In this barter economy, you exchange apples for oranges, and vice versa. Therefore, the amount of apples necessary to buy one orange is the price of an orange (in apples). The figure shows the orange market. The x-axis indicates the quantity of oranges. Moving to the right on the x-axis, the quantity of oranges in the market increases. Moving to the left on the x-axis, the quantity of oranges in the market decreases. The y-axis measures the price of oranges. As you move up on the y-axis, the price of an orange increases; it means that you give up more apples to buy one orange. As you move down on the y-axis, the price of orange decreases; it means that you give up fewer apples to buy one orange. In microeconomic analysis, the market for a good, in this case, the market for oranges, is shown by the demand and supply curves. 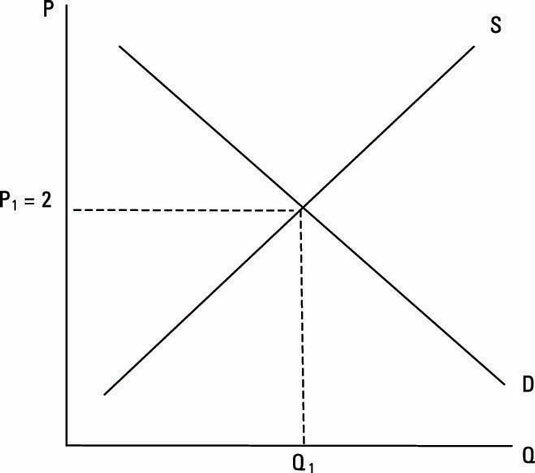 The demand curve represents the consumers’ demand for oranges. 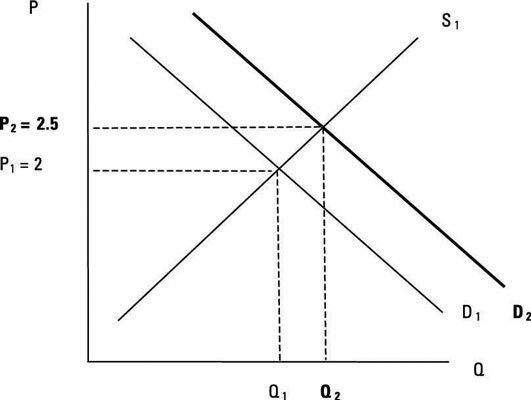 The negative slope of the demand curve implies that as the price of oranges increases, the quantity demanded of oranges declines, and vice versa. The supply curve shows the behavior of orange producers. The positive slope of the supply curve indicates that as the price of oranges increases, orange producers supply a higher quantity of oranges, and vice versa. 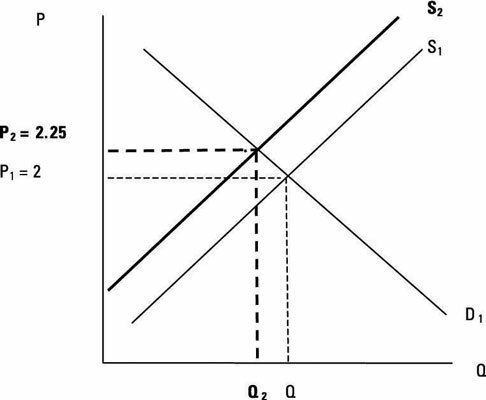 The intersection of the demand and supply curves indicates the market price and quantity of oranges. Another term for the market price and quantity of oranges is the equilibrium price and quantity of oranges. In this example, the market price of oranges is 2 apples, which means that consumers give up 2 apples to buy an orange, and producers receive 2 apples when they sell an orange. The equilibrium price and quantity of oranges doesn’t stay the same, so you want to predict the changes in the price and quantity of oranges in the market. If any changes occur in the factors that affect either the supply or the demand curve, the equilibrium price and quantity of oranges changes. In economics jargon, these factors are called ceteris paribus conditions (meaning “everything else constant”). The assumption is that the values of these factors are fixed along the demand and supply curves. When they change, the curve shifts in the appropriate direction. Assume that the latest medical research indicates that oranges cure cancer. The demand for oranges then rises. An increase in the demand for oranges increases the price and quantity of oranges in the market. Now assume that excessive cold destroyed most of the orange harvest in the U.S. In this case, the supply curve declines. A decline in the supply curve increases the price of oranges and decreases the quantity of oranges in the market. These changes can occur simultaneously. 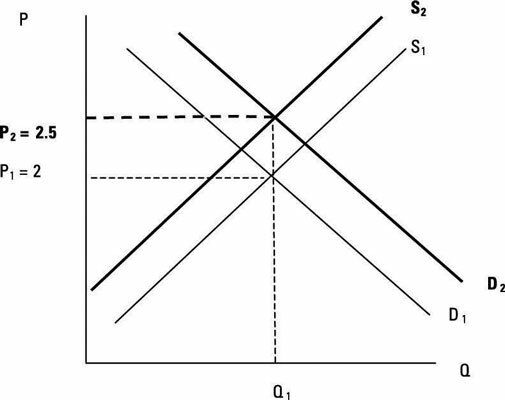 As you see, if the demand curve increases thanks to the incredible health benefits of oranges and the supply curve decreases because of cold weather, the price of oranges will increase. The price of oranges increases to 2.5 apples per orange. But the effect on quantity is undetermined. The following figure shows one of the three possible outcomes in terms of quantity and assumes no change in the quantity of oranges because the increase in the demand curve is the same as the decline in the supply curve. Of course, you can change your assumptions regarding the nature of the shocks affecting the orange market. This time, assume harmful properties of oranges to health (oranges cause cancer) and, at the same time, the introduction of a disease-resistant variety of orange trees. In this case, the demand curve declines and the supply curve increases, lowering the market price of oranges with an undetermined output effect.